Step 1: Place A Fabric Board Using Style FW800 In The Shopping Cart. Choose From Over 50 Colors. Step 2: Use The French Bulletin Board Upgrade UPG202 To Add The Ribbon And Brads. There are unlimited options when creating a Custom French Bulletin Board. clients and are for reference only. Let us know which number you like and we can create a "similar"
memory board with ribbon for your home or office. WITH FABRIC - WE THEN ADD THE RIBBON AND BRADS. 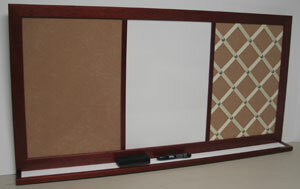 We manufacture custom french bulletin boards and memory boards with ribbon. Our high quality boards use natural self healing cork as a base and also function as a bulletin board for push pins. Our custom memory boards can be made in any size. 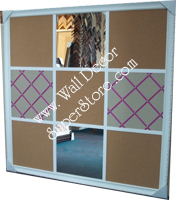 We offer framed or frameless french bulletin boards. board with ribbon to fit your decor. Choose the fabric, ribbon and brads to make a memory board unique to your decor. brads to create the perfect french bulletin board for your decor. Contact us for Details.